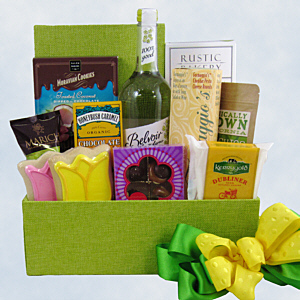 Spring is in the air and in this gift - a brightly colored collection of delectable treats. The Belvoir Elderflower Presse is a Fancifull Favorite - light and refreshing. It is surrounded by Tulip Shaped Sugar Cookies, Dubliner Irish Cheese, Formaggio Cheddar Pesto Biscuits, Cashew Caramel Clusters, Moravian Toasted Coconut and Chocolate Cookies, Rustic Bakery Organic Flatbread, Organic Pistachios, Marich Chocolate Toffee Nuts, and Tea Room Honeybush Caramel Chocolate Fusion Bar. A bit of sunshine delivered in our spring green linen covered box.